Rent A Lift can deliver your New Doosan Forklift with excellent delivery times, complemented with a range of finance and rental options. When purchasing or hiring a New Doosan Forklift we will assist you when choosing the right model for your needs? Not sure what you need? We’ll do a free site survey & recommend the optimal solution. 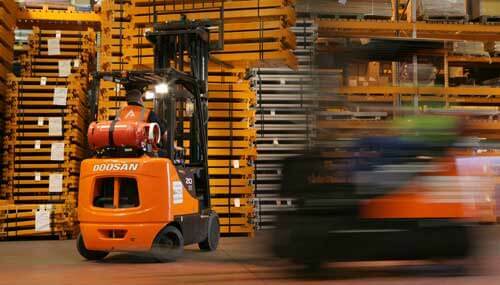 Doosan is the only major supplier to have two series of forklifts. Building rugged, reliable, yet simple trucks, has allowed us to become the leading provider of value forklifts in the UK. Our Pro-5 range is the cornerstone of our business. The complete range of electric, LPG and diesel Pro-5 models is our most successful ever, with a host of features including our trademark oil cooled disk brakes and integral side-shift as standard, plus our award-winning safety features and class-leading ergonomics. Our economy GX Series was developed to provide a low-cost option of forklift without sacrificing build quality and reliability. In addition to popular features such as spacious operating compartments, excellent visibility and high powered engines, the GX also includes operator sensing and rugged, proven components. The latest addition to our materials handling product offering, the warehouse range includes pallet trucks, stackers and order pickers designed and built by Doosan in Germany. Characterised by high-quality manufacturing and heavy-duty materials, the warehouse models offer rugged productivity and durability. In addition to superb features such as oil cooled disk brakes, swing-down bottle carriers and integral side shift, Doosan continually strives to bring innovations to its forklift range. Our LPG trucks have some of the lowest emissions on the market, whilst at the top end of our range, our 11, 13 and 16 tonnes capacity models have some of the most ergonomic operator compartments in the market.